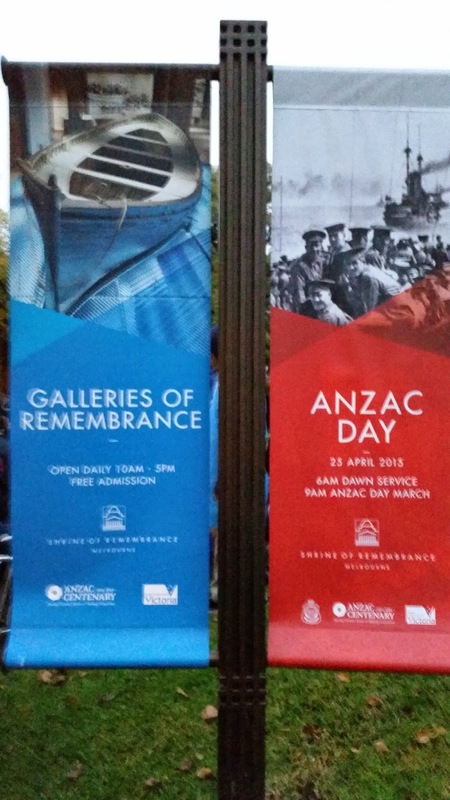 Today is Anzac Day - a day that is very important for Australians and New Zealanders. It is a day where we gather together to commemorate the sacrifices that have been made by those who have served our respective countries.It is always an emotional day, and a special day, but it was more so today because it is the 100th anniversary of the landings at Gallipolli. Over my years of blogging I have written a number of posts about Anzac Day so I won't talk too much more about the history of the day. 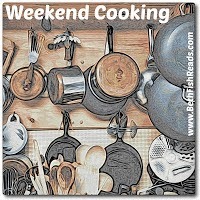 Instead, I thought that I would share my day, and one particular aspect of it for Weekend Cooking, because today I did something I have been meaning to do for years and years but never quite gotten around to. 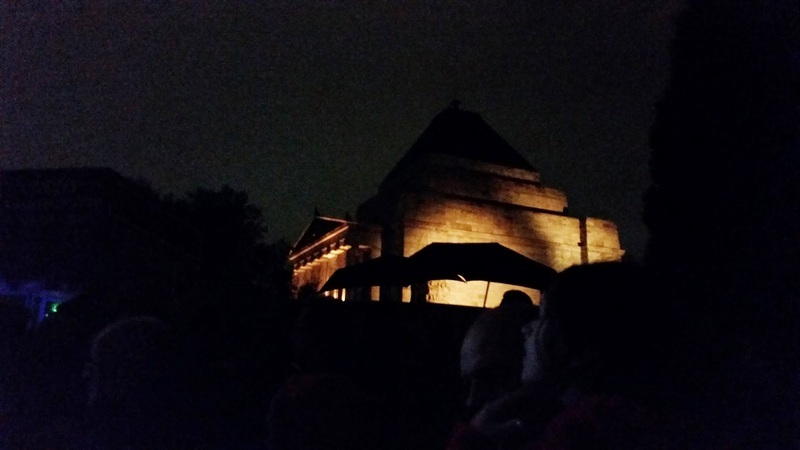 I went to the Dawn Service at the Melbourne Shrine of Remembrance. A number of weeks ago I was talking with a friend about the fact that I had never actually been to a dawn service and she said that she hadn't either. Given that it is the 100th anniversary we both agreed that this was the year to do it, and so a plan was born. We figured that if we both committed to it then neither of us would be tempted to rollover and go back to sleep because it was too cold or wet, we were too tired or whatever the excuse was we came up with on the day. 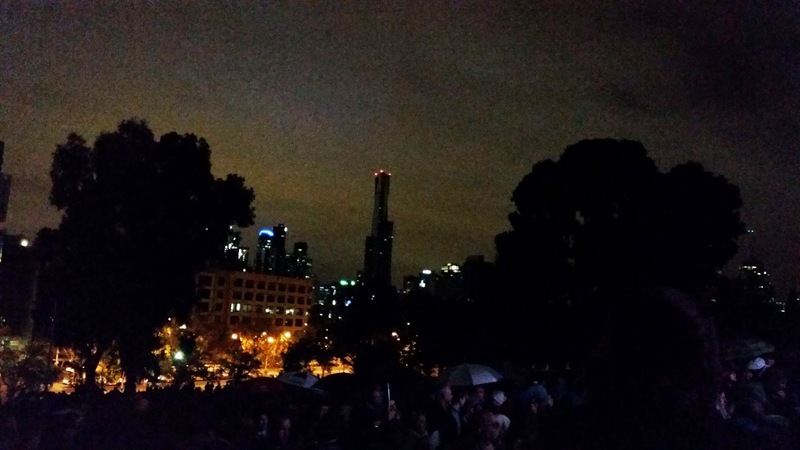 We therefore headed into the city around 4am and made our way to the Shrine of Remembrance, a building I had only visited for the first time back in January, and joined around 80000 other like minded people to wait for the coming dawn. One of the most incredible things was realising how quiet that number of people can be sometimes, particularly during the minute's silence. I get emotional whenever I hear the Last Post play and today was no exception but there were many other emotional moments too, such as hearing the hymn Abide with Me interspersed with a gun salute and hearing current and former service men sharing stories not only from WWI but also showing how the hardships faced back then can be linked with our current soldiers who answer the call whenever they are required to serve around the world. I thought I would share a couple of the photos I took before getting to the foody part of this post. 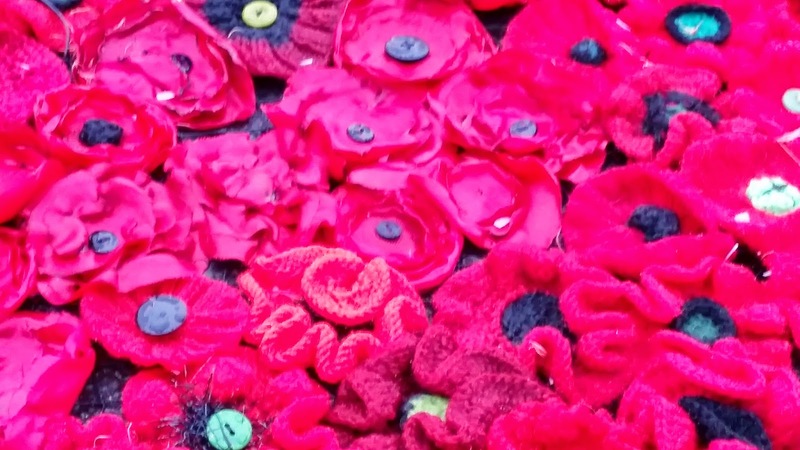 One of the things that they did for this year was ask the community to knit some poppies. 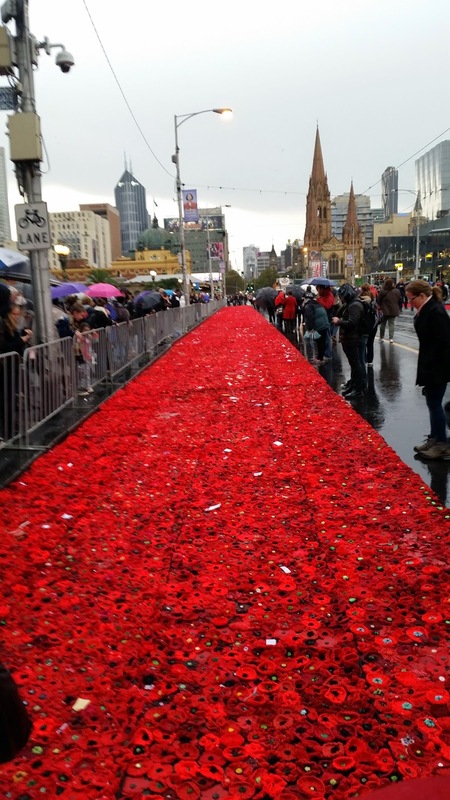 Yesterday they formed a carpet in Fed Square, one of the major public spaces here in Melbourne, but today they lined either side of Princes Bridge which was part of the route for the parade that also happened today. It is a pity that it was so wet today as the poppies looked a bit sodden but it still looked very effective. Up until this week I don't believe I had ever heard the term gunfire breakfast, or if I had it had definitely slipped from my somewhat porous mind. I was talking to my sister about coming into the ceremony and she mentioned staying for the gunfire breakfast. This is apparently part of the traditions of Anzac Day with a lot of Returned Services Leagues (RSL) putting on the breakfast after local ceremonies. For ours, a gold coin donation was requested with proceeds going towards charities that work with former soldiers. What is the gunfire breakfast? Glad you asked. Back in World War I, the diggers would be given a breakfast of .... before they faced going over the top and into the path of danger and for so many of them potential death or injury. During the ceremony today, they talked about the original gunfire breakfast consisting of black coffee laced with rum, some beef and potatoes and maybe some biscuits, although there does seem to be a bit of conjecture around the definition of what made up a gunfire breakfast. Regardless, I am not sure that I would feel the need to eat much if I knew that at some point in the coming day I would be facing imminent death! Today's breakfast wasn't fancy, and possibly not all that recognisable by original diggers but still there was no actual gunfire so that's a bonus. The food today was provided by the catering corps of the army. Probably my first and perhaps last time to be fed by such a group! It was interesting because we were standing near the family of a soldier from the catering corps so we got to eavesdrop on their conversation. It turns out that today to feed however many thousands of people stopped for breakfast there were 10 tents that between them were expected to serve up around 900 kilos of sausages alone! Must be a huge logistical event!! I presume that we were eating powdered egg rather than the real thing because otherwise it would be difficult to imagine breaking that many eggs! Apparently there were also a lot of Anzac biscuits that were being given away but we didn't end up lining up for those! So whilst this might not be the prettiest or tastiest breakfast I have ever had, it certainly had a lot of meaning and seemed like a perfect way to follow the dawn service.. 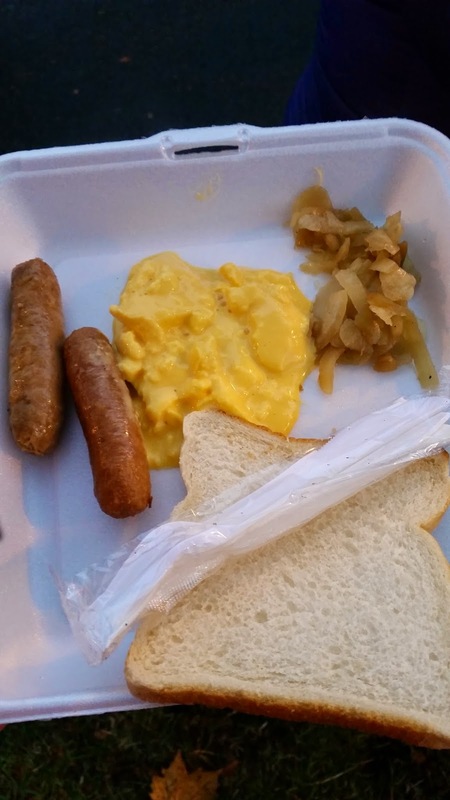 It consisted of sausages, eggs, onions and bread. We did end up heading back into the city to find nice coffee, something the coffee lovers with me insisted upon! !